Arthur Miller remains a giant in twentieth century American theater — after all, Miller wrote three of the most recognizable plays of the mid-twentieth century. His 1964 play After the Fall is among his most personal works. Though the play itself has its critics for being a thinly-veiled and thus perhaps overly confessional account of Miller’s failed marriage to Marilyn Monroe, that criticism is no reason not to see this production by Variations Theatre Company at the Chain Theatre in the Long Island City section of Queens, New York City. After the Fall is about Quentin (Kirk Gostkowski), a high-profile lawyer, and his lifelong troubled relationships with women. In particular, it focuses on his relationships with four women in his life: his overbearing mother (Kathleen Stuart), his fiercely independent first wife Louise (Amy Newhall), his beautiful yet insecure second wife Maggie (Thea Brooks), and Holga (Liz Tancredi), a woman from Germany who is unable to come to terms with her past involvement with the Nazis. Quentin is considering marrying her, realizing that he can relate to her inability to reconcile her past. The first Act’s non-linear structure shows how troubles from each relationship affect the others, and while the play can be challenging to follow chronologically the emotional impact of these relationship issues on Quentin are impossible to miss. Act II is dominated by Quentin and Maggie’s growing relationship, with Maggie going from a naive switchboard operator to world-famous singer to a emotionally broken drug-addict. The play also touches upon the HUAC trial hysteria (which Miller of course wrote about allegorically in The Crucible) and uses Quentin position as a lawyer to take a moral high ground on the shameful proceedings. Without question, the highlight of this production is the cast. The set is minimalist, with images projected as backgrounds during key moments in the narrative and effective lighting effects by lighting designer Greg Solomon. Gostkowski aptly runs the gauntlet of Quentin’s life with remarkable confidence, which is key to making the play work because his character is the center in which the rest of the cast acts around. If Quentin doesn’t work, the play would fall apart, but Gostkowski is willing to go anywhere he can to ensure that doesn’t happen. The lone exception to his dominance is Brooks as Maggie, who has a limited role in the first act as a playful flirt (and Brooks has perfected Marilyn Monroe’s lusty and breathy way of speaking) but grows into a multifaceted character damaged by emotional insecurities and the price of fame. Their relationship is what fuels Act II, and Gostkowski smoothly moves from speaking to Maggie as if she is a lost, curious child when they first meet to their rage-filled arguments about Maggie using her frequent overdoses to prove Quentin’s love for her. I was most impressed by her physical transformation from wide-eyed girl to beautiful superstar to (I hope she will not mind me saying so) grotesque addict. Of course, After the Fall is not a two-person play. Some of the standouts of the rest of the cast include Bill Toscano and Stuart, who play Quentin’s parents, who reach emotional heights that are perhaps only equaled by Deven Anderson as Mickey and Matthew Dalton Lynch as Lou, two of Quentin’s colleagues who stand on opposite sides about naming names to the HUAC committee. Anderson gives Mickey the kind of aggressive, cocky confidence than the nebbish Lou lacks — though Lynch still physically demonstrates Lou’s anger at Mickey’s willingness to name names. Rounding out the leads are Newhall as Louise and Tancredi as Holga. It’s difficult for them to compete with the sheer magnetism of Brooks as Maggie — especially since Maggie gets so much more stage time — but they assert themselves to make sure Maggie’s character won’t relegate them or their characters to background players. Whenever I see a production with a cast full of this much talent, I often wonder if the production team had it easy and if these veteran actors took it upon themselves to push their performances. I’m sure that’s not the case, but black box theatre is all about acting talent because if you can’t act in a minimalist setting, you can’t act at all. Needless to say, this cast has it. My only recommendation would be to read up a bit on Arthur Miller’s personal life before seeing the play because that definitely makes the story easier to follow — even a quick glance at his Wikipedia page would help. After the Fall is the first full production at the Chain Theatre (so named because it is housed in what was once a chain factory — a “U.S. Chain Co.” ghost sign remains above the entrance). Being only a quick subway ride under the East River from Manhattan, it’s a perfect intimate black box venue in the burgeoning artistic community in Long Island City. 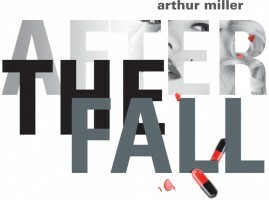 After the Fall runs January 20th, 22nd – 27th, 29th, and February 2nd at The Chain Theatre. For information, visit Variations Theatre Group.